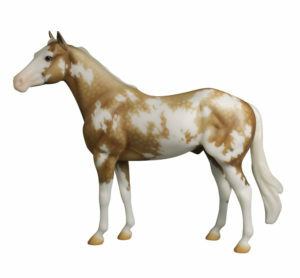 The Breyer News page revealed the BreyerFest Auction Lot #4. She is Areia the Sunday Raffle model. She is the new Premier Club Geronimo mold in a pretty sooty dapple palomino pinto. Hopefully our countdown will brighten your Monday morning! Lot #4 is on Mold No. 733, Geronimo, as a Sooty Dapple Palomino Pinto. Here are some of the other BreyerFest 2016 Prize and Raffle models. The list isn’t quite complete as not all of the horses were announced at the time that I wrote it. 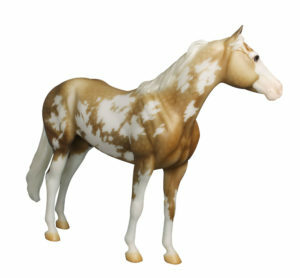 « BreyerFest Auction Lot #5 Is The Connemara Mare With Super Flair!